The Bible is right. Whn u train up a child d way he shld go, whn he‘s old he cannot depart 4rm it. Dis is a solid foundation on whc 2 build up a good character in a child. Trust me d parent wll b hapi 4 it in d near future. she will grow up to be an evangelist. 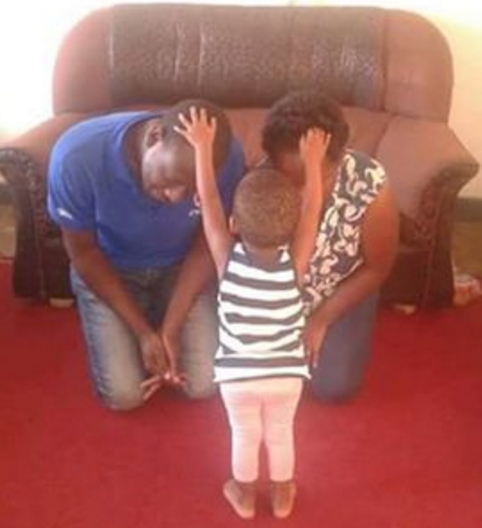 The prayers of a sinless baby girl like that above gets to heaven faster than that of adult saint. As I examined this picture, real or play, I membered what our Lord and Savior-Christ Jesus said to his diciples trying to ban little children from him. He said whosoever want to inherit His kingdom in heaven must have a mindsets of sinless little children. We also must remember that what separate us from God Almighty is our sin. What an interesting picture! Kudos to naijagists. Wow, I love this. God give me a child like this. very soon my Beu Beu will be doing the same. yeah! Nice one bt dis baby set die,jst take a look at her figure in dis little age hmmm dis wil tel u how beautiful she wil b.